If the hover drawers are not your thing, try the new "Focus Mode" where the drawers open when you click on Winamp and stay open until you start using another program. Be sure to use Winamp 5.04 which has several important skinning related fixes since 5.03. Many thanks to all of the breed members (883 especially for his supreme bug finding abilities) and other users that submitted feedback and suggestions! The playlist, video window and media library will have the multipass skin while the main window will not show. If I click it to show it(the main window)it comes up with the default classic skin. Any ideas how I can fix it? man i don't know how you can work so fine for free... This skin rocks!!! The Carbon style is absolutely gorgeous! I love it, if I could propose marriage to it, I would...it's just that damn good! Thank you!!! Great updates. 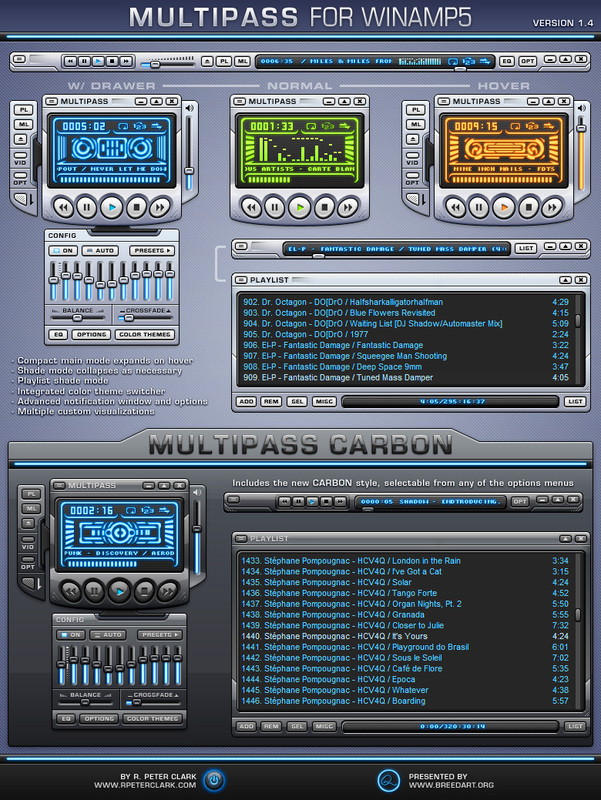 I said before that it was the best winamp skin ever and it is. It's now that much better. Love the carbon. This is fantastic, the black plastic carbon is just perfection kind of has a black techy feel or somewhat to it. Currently loving "Fear of Halogen". mmm black and purple/cyan is most yummy, the detail is so YES. You should really think about skinning GUI kits or something along those lines in the near future. This player is so sleek, I'd definately think this beats MMD3 now. The best skin I've ever seen ! love the new carbon theme. This is truly a superb skin. Simply fantastic. I would give my left pinky toe to make a windowblind out of all the colors. You probably, already have someone working on it though, so I'll wait. This is the only winamp skin that I can see myself using with every windowblinds skin I have. It's as close to perfection as you can get without offending any deities. Amazing work and thank you thank you thank you. I love it. How Do You Install This Skin, Its not a .wal file..
Weezy, you can place Multipass.zip directly into your Winamp\Skins folder or you can simply rename the file to Multipass.wal and then double-click it.